The Ford F-150 (2015) is part of Ford’s current thirteenth-generation pickup truck F-Series lineup. In production since 2014, the latest generation of F-150 trucks are the first in the F-Series to adopt an aluminum body to reduce overall weight and increase fuel economy. The Ford F-150 (2015) has an overall length of 19’4” | 5.89 m, wheelbase of 12’5” | 3.78 m, a width of 6’8” | 2.03 m, and height of 6’ 3.5” | 1.92 m. The Ford F-150 is the best selling vehicle in the US. 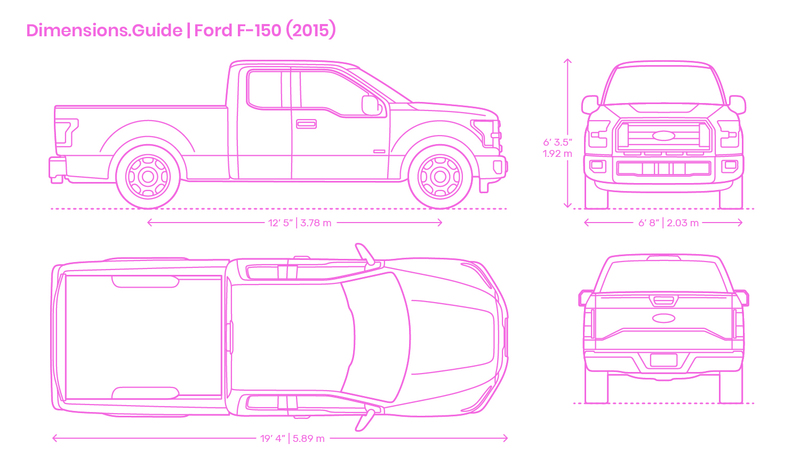 How big is the Ford F-150 (2015)? The Ford F-150 (2015) has a length of 19’4” | 5.89 m, wheelbase of 12’5” | 3.78 m, width of 6’8” | 2.03 m, and height of 6’ 3.5” | 1.92 m.
What generation model is the Ford F-100 (1978)? The 2015 Ford F-150 is a thirteenth-generation model of the Ford F-Series. The thirteenth-generation is the current generation of the Ford F-Series truck line. How much does the Ford F-150 (2015) weigh? The Ford F-150 (2015) has a base weight of 4,300 lb | 1950 kg.